Since the first time I tasted pecan pie it has been my favorite Thanksgiving dessert, and one of my favorite all time desserts -- which is pretty hard to believe considering it has no chocolate. Something about the gooeyness and nuttiness...yum. I've always used a simple recipe I found online for pecan pie, but after all this recent talk about the evil that is corn syrup, I decided to replace some of the corn syrup with honey. I also made them in a muffin pan, which allowed them to be super cute. Its funny how you can take any standard dessert, make them in a small pan, and all of sudden, cuteness. For the crusts, I used my go-to pie crust recipe, but continuing with my whole wheat challenge, I swapped the regular flour with whole wheat pastry. The result was still good, although I have to admit that I could taste a difference in the pie crust. The whole wheat definitely tasted more wholesome, which is not necessarily bad, but not as good as the standard buttery pie crust. Maybe more butter would help. Or maybe a half and half mixture. Otherwise these little tartelettes were pretty awesome. Sweet, gooey, nutty all wrapped in a cute little package. 2. Using a 2in diameter cookie cutter, cut 16 rounds of pie dough. Lightly press into a buttered muffin pan. 3. In a large bowl, whisk together eggs, honey, syrup, sugar, flour, salt and vanilla. Pour about 2-3 Tablespoons in each mini pie shell. Be careful that the filling doesn't flow over the shell. 4. Spread 2 Tb pecans in each shell. Bake at 375 deg F. for 20 minutes or until filling is set. Remove each tartelette onto cooling rack and let cool for at least 10 minutes before serving. 1. Combine flour and salt in large bowl; cut in butter with pastry blender or fork until mixture resembles coarse crumbs. Stir in enough water with fork just until flour is moistened. 2. Shape dough ball. Flatten slightly. Wrap ball in plastic food wrap and refrigerate for at least 30 minutes. 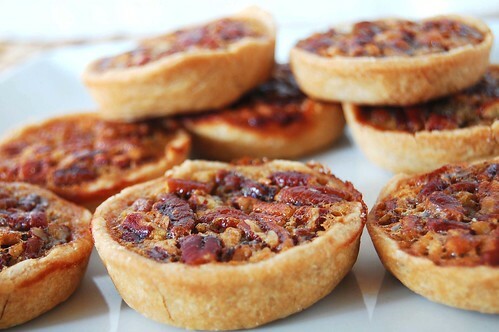 So cute, I like mini tarts because they make me feel like I am eating less so then I get to eat more of them. 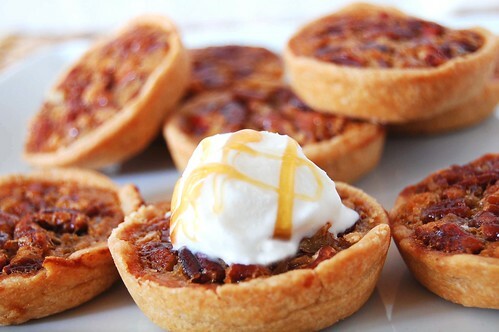 I also love pecan pie, making these may just be my get out of jail free card. These are cute! I made a pecanless version of the same thing and blogged about it last month. YUMM!! I used corn syrup in mine, too. Really, the stuff isn't as bad as some people say it is. As with almost all food items, you should just consume it in moderation. Oh my! Lets make these for thanksgiving. Can you believe I've never tried pecan pie? I think you might have convinced me to try it with these cute little pies! Oh wow, thanks for making pecan pie and posting about it. The pictures make me hungry. I just love this blog!!! Just by looking it makes me hungry too. It is easy to make. I want to try. these tarts are amazing. i've made them twice now- once with short crust pastry and once with puff pastry. both times they've turned out super. I've never liked pecan pie, but my bf loves it so I gave this a try. The honey makes them taste like baklava. And baklava rocks. I'm putting together a food blogger recipe feature for HuffPost Taste of all our favorite pecan recipes from across the web and would love to include this recipe. Can we have permission to use your photo (with a link back to you)?